Approximately 1500 light-years away from Earth in the constellation Cygnus, the wispy clouds of heated and ionized dust make up what is known as the Veil of Witch’s Broom Nebula. 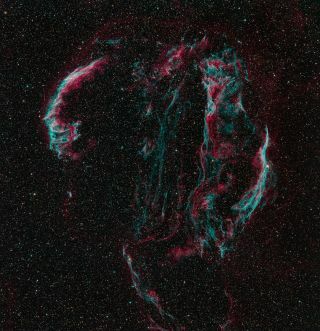 Remnants of an exploded supernova appear as ghostly wisps in this skywatching photo of the Veil Nebula. Avid astrophotographers Bob and Janice Fera took this spectacular photo on September 2011 from Mike Sherick's Sagrada Observatory in Las Cruces, New Mexico. Left behind by the explosion of a massive star, the veil nebula is one of the largest and most spectacular supernova remnants in the sky. Some 1500 light-years away from Earth, the wispy clouds of heated and ionized dust make up what is known as the Veil of Witch’s Broom Nebula. The source star of the nebula exploded more than 5,000 years ago. The nebula lies in the constellation Cygnus. The Veil Nebula spreads about three degrees in diameter or an area roughly six times wide as that of the full moon. Its rope-like remnants of gas and dust resemble a light woman’s veil in the sky. The colors in the nebula are from the the presence of oxygen, sulfur, and hydrogen.